This best-selling classic provides a great introduction on what appreciative inquiry is and how to apply it. Sue has updated the 3rd edition with the latest research and new examples. The Thin Book of® Appreciative Inquiry is the introduction to the exciting organizational change philosophy called Appreciative Inquiry. Appreciative Inquiry is a way of thinking, seeing and acting for powerful, purposeful change in organizations. It is particularly useful in systems being overwhelmed by a constant demand for change. Appreciative Inquiry approaches change by assuming that whatever you want more of already exists in all organizations. 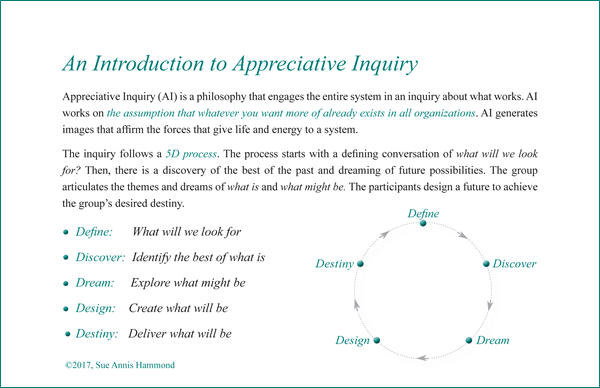 While traditional problem-solving processes separate, dissect, and pull apart systems, Appreciative Inquiry generates affirming images that pull people together. People discover what the organization does well, how it does it and designs ways to do more of what works. Unlike a cookbook approach to change, Appreciative Inquiry is a thought process. The book introduces you to that process in simple language and includes references on where to go for more in-depth study. The 2nd Edition of The Thin Book of® SOAR uses the Appreciative Inquiry philosophy to provide a strategic thinking and dialogue process for all levels of an organization. Sue is a nationally recognized expert in Appreciative Inquiry, a process that changes the focus from finding out what is going wrong to discovering and expanding best practices in organizations. Her first book The Thin Book of® Appreciative Inquiry is a national bestseller, with sales in excess of 200,000 copies. Sue started Thin Book Publishing in response to the book's success and customer requests for more "thin books". The company is devoted to publishing "just in time" cutting-edge knowledge for organizational clients. Our latest efforts are focused on online courses. The Thin Book of Appreciative Inquiry Reference Cards, is a 20-pack of the 2-sided, pull-out card that will appear in future printings of The Thin Book of® Appreciative Inquiry. This card provides a brief overview of Appreciative Inquiry(AI) and the 8 assumptions that 'translate' the underlying principles of the theory of AI in simpler language. If your budget doesn't allow for a purchase of the AI book for everyone, give everyone this card instead. The cards are 8" x 5" and are UV coated.